In its non-native locations, especially in coastal habitats, Colubrina asiatica aggressively outcompetes native vegetation. It is found, most often at the interface of uplands and submerged lands or between beach dune and maritime hammock. C. asiatica is also frequently found along elevated road shoulders in coastal areas, from where it can spread into adjacent natural areas. Plants grow rapidly in full sun. Its seeds are constantly dispersed at a rapid rate by ocean currents, and seed-eating birds may also ingest them as crop stones, producing a wider dispersal range. C. asiatica exhibits tremendous vegetative regeneration, including adventitious rooting from branches coming in contact with the soil and vigorous resprouting from cut or injured stems. C. asiatica, a shrubby member of the buckthorn family (Rhamnaceae), is also called latherleaf because of its ability to produce a lather in water. It is a low shrub with long, climbing, or drooping branches that can reach 6m or more. The leaves are 0.05 to 0.1m long, egg-shaped, and easily recognised by their shiny, green upper surfaces and toothed edges. They are attached to stems by slender stalks and are arranged alternately along the branches. Flowers are clusters of small, greenish-white flowers at the junctures of leaf and stem. The fruits are small capsules, measuring less than 1.27cm across. At first green and fleshy, the capsules become dark brown with age. Each fruit contains three, tiny, grayish seeds (Jones, 1997). Jones (1997) states that little is known about seed germination except that it requires loose soil and does not normally occur on exposed rock. Seeds are believed to retain their viability in the soil for at least several (3-5) years. Schultz (1992) reports that germination and growth rate of seedlings increases with the removal of the shading canopy. Seeds may remain viable after floating in saltwater for many months (Guppy 1906, Carlquist 1966, in Schultz, 1992). C. asiatica leaves contain a useful saponin-like substance (Johnston 1971, in Schultz, 1992). In Hawai‘i and elsewhere, the plant is used medicinally and its leaves have long been used for soap as they form a lather in water (Neal 1965, in Schultz, 1992). Natural communities where C. asiatica is found include beach dunes (Long and Lakela 1976, Wunderlin 1982, in Schultz, 1992), coastal strands (Norma Jeanne Byrd pers. comm. 1992, in Schultz, 1992), maritime hammock (coastal forests) (Wunderlin 1982, Myers and Ewel 1990, in Schultz, 1992), tidal marshs (Jim Duquesnel pers. comm. 1992, in Schultz, 1992), and tidal mangrove swamps (Godfrey and Wooten 1981, Olmstead et al. 1981, Byrd 1992, in Schultz, 1992). It is most often found growing at the interface of uplands and submerged lands (Langeland 1990, in Schultz, 1992) or between beach dune and maritime hammock (Duquesnel 1992, in Schultz, 1992). Jones (1997) reports that it can invade both disturbed and undisturbed forest sites. Coastal hammocks are especially good habitats as they occur on flood-free sites created from the deposition of soils left by storms and tidal influences. Natural ridges or berms that have formed within inundated mangrove forests can also support C. asiatica. It is also frequently found along elevated road shoulders in coastal areas, from which it can spread into adjacent natural areas. Schultz (1992) states that plants grow rapidly in full sun. Jones (1997) states that C. asiatica reproduces sexually and vegetatively. It exhibits tremendous vegetative regeneration, including adventitious rooting from branches coming in contact with the soil and vigorous resprouting from cut or injured stems. It has been reported that plants can flower and fruit within the first year of growth. Seedlings reach sexual maturity in about one year, and even young plants produce many seeds, so open areas around the plant are rapidly colonised (Duquesnel 1992, in Schultz, 1992). Solitary individuals are found only under two conditions: if they are too young to fruit or if they are growing in dense vegetation (Schultz, 1992). It is believed to have been carried to Jamaica in the 1850s by East Asian immigrants, probably on account of its traditional uses (food, medicine, fish poison, and soap substitute) (Jones, 1997).It was introduced into the Caribbean Islands from Asia where it escaped from cultivation (Langeland 1990, in Schultz, 1992). Recommended citation: Global Invasive Species Database (2019) Species profile: Colubrina asiatica. Downloaded from http://www.iucngisd.org/gisd/species.php?sc=371 on 19-04-2019. Jones (1997) reports that C. asiatica produces a thick mat of tangled stems that can be several feet thick, impacting the underlying vegetation by growing on it or shading it out. 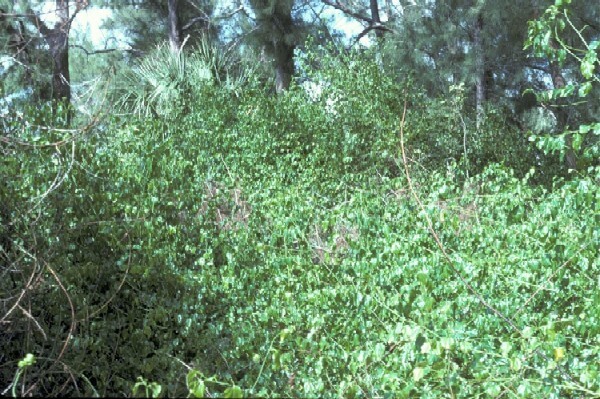 Its occurrence in Florida’s coastal tropical hardwood forests is of special concern due to the unique nature of this habitat and the rarity of some of its constituent plant species, including a number of Florida State-listed threatened and endangered species. Sites infested by C. asiatica experience a great reduction in biological diversity as very few plants (including the seedlings of the plant itself) can persist under these conditions. Hammocks comprised of native, tropical hardwoods and buttonwoods (Conocarpus erectus L.) are especially vulnerable. Impacts to natural areas include alterations to community composition and structure, diminishment of natural habitats for native wildlife, disruption of species relationships and interactions, and interference with ecological and geological processes such as water and nutrient cycling. Jones (1997) reports that mechanical and chemical methods are the primary means of control. \r\nPhysical: Seedlings and young plants, up to about 1.5m tall, may be hand-pulled as long as their root systems are small and can also be removed. Care should be taken not to disturb the soil any more than necessary. \r\nChemical: The application of a 10% solution of triclopyr (e.g., Garlon 4) in a band around the base of the trunk (basal bark method) or application of a 50% solution of the same (e.g., Garlon 3A) on a freshly cut trunk (cut stump method) are the most effective ways to kill adult plants. The application of a 3% solution of triclopyr to the foliage (foliar application method) may be used if non-target vegetation in the immediate vicinity will not be impacted by herbicide drift. Because of the possibility of resprouting from the rooted portions of the plant, follow-up inspections and retreatments may be necessary for a year (if not longer) following the initial treatment. In addition, the long viability of seeds in the soil requires monitoring of treatment sites for several years after the initial treatment. \r\nBiological: Schultz (1992) cites that biological control of C. Asiatica needs to be investigated. Apparently no research is currently underway or planned (Dan Austin, pers. Comm. 1992, Langeland 1990, in Schultz, 1992). 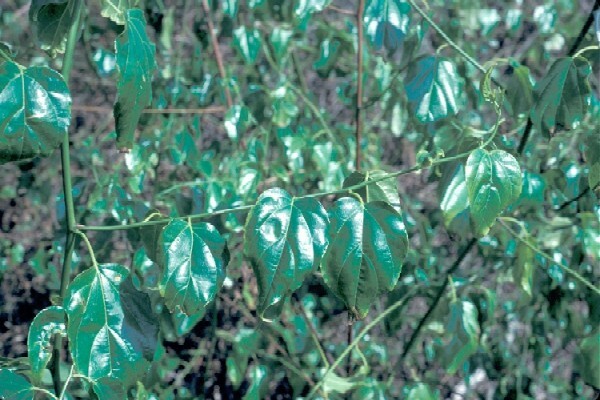 However, because both the genus Colubrina and the family Rhamnaceae contain native species as well, biocontrol efforts directed at C. Asiatica should be approached cautiously. Informations on Colubrina asiatica has been recorded for the following locations. Click on the name for additional informations. Jones D. T. (1997) Asiatic Colubrina. National Park Service, Plant Conservation Alliance, Alien Plant Working Group. Summary: Detailed report on description, distribution, habitat, reproduction methods and management. Schultz G. E. (1992) Element Stewardship Abstract for Colubrina asiatica. The Nature Conservancy.